Nissan Kicks comes in two-toned colours with its body covered in a metallic silver and the roof sporting a punchy orange. The Kicks is now 89 mm longer for the Indian market. Bookings begin from 14 December. The LED projector headlamps with DRLs give out a very aggressive stance to the car. The Nissan Kicks also comes equipped with R17 5-spoke machined alloy wheels. The aggressive design elements continue at the rear end with sharp-looking wrap-around tail lamps. Nissan Kicks also sports a shark-fin-shaped antenna which has now become a trend. The interiors too come in two-tone colour combination and are subtle. Also, the seats have leather upholstery. Nissan Kicks steering wheel too has leather upholstery and features mounted controls. 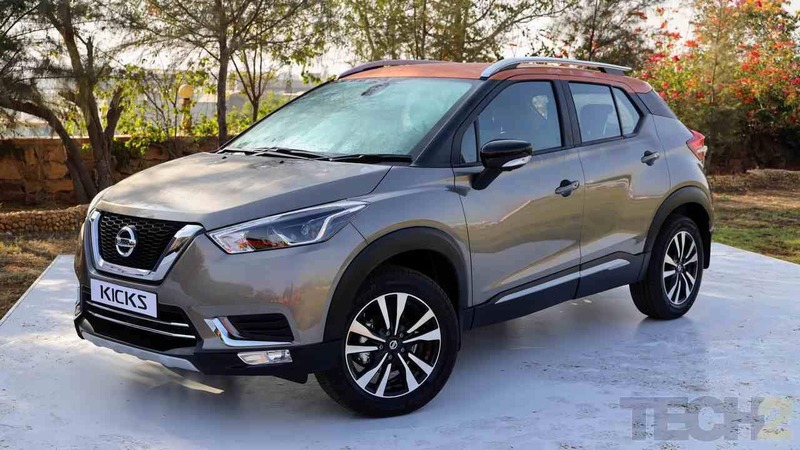 Nissan Kicks interiors has a free-standing eight-inch touchscreen, that comes bundled with Apple CarPlay and Android Auto connectivity, apart from a segment-first 360-degree reversing camera. Other notable features are cruise control, hill-start assist and an eco mode.